Strawberry Cheesecake is easy recipe for delicious spring and summer dessert, and this cake will look perfect at your Easter table, too! This strawberry dessert is the classic, melt-in your-mouth New York Style Cheesecake with a delicious twist! It’s finished with a gorgeous homemade strawberry topping and it tastes as amazing as it looks! 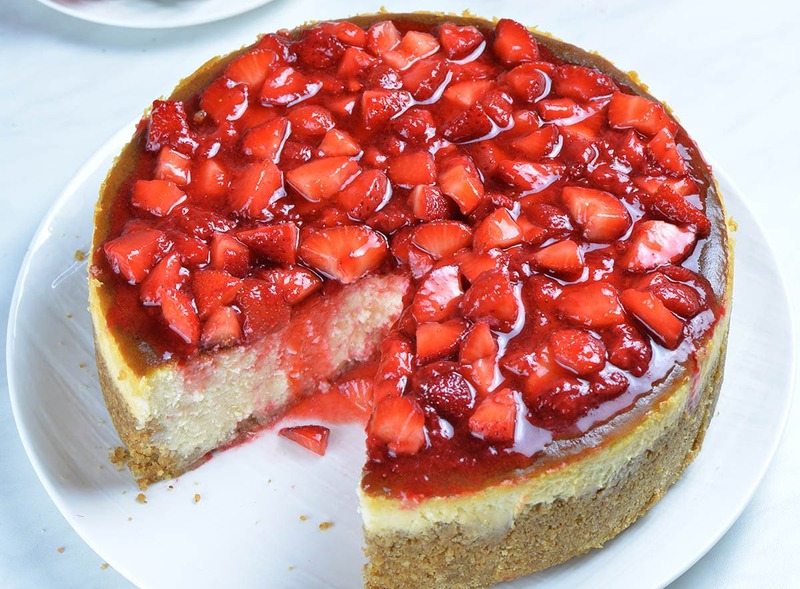 This Strawberry Cheesecake recipe is so easy to make and even easier devour or share with your family and friends. Delicious cheesecake with strawberry topping looks fancy enough to shows up at birthday parties or holidays. It will be perfect Easter dessert, too! 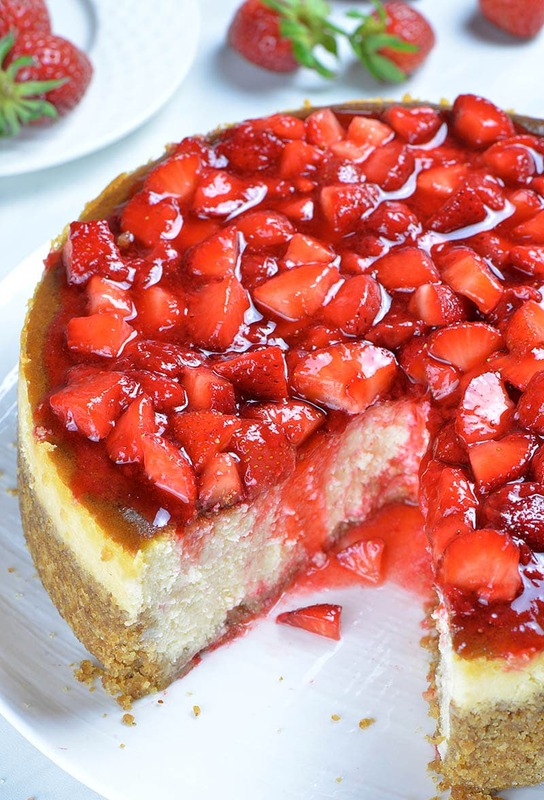 Strawberry Cheesecake is rich and dense, but creamy and smooth at the same time. Homemade strawberry topping is light syrup with cooked and fresh strawberries, and it make this cake absolutely delicious! The base of this cake is New York Style Cheesecake that I’ve shared before in its naked glory. It’s rich and delicious enough to serve it plain. But springtime inspired me to take it over the top with irresistible strawberry sauce! And there it is! Awesome Strawberry Cheesecake is here! It’s perfect recipe to open strawberry baking season! If you love strawberries, too, you won’t be able to resist a strawberry sauce that slowly drips down the slice of smooth and creamy cheesecake. If you like rich and dense, but smooth and creamy consistency of a cheesecake, make sure to use full fat cream cheese and room temperature ingredients. The most common issue is how to avoid the cracks at the top of cheesecake. The trick is not to over beating the batter after adding the eggs. Therefore, make sure to run your mixer on low speed because you don’t want to incorporate a lot of air into the batter. Just slowly combine ingredients until smooth. Cracks could appear because too much moisture is losing during the baking or because the cheesecake is over baked, too. That’s the reason way you should always use water bath for cheesecake. Water bath keep moisture and evenly distribute the heat. Homemade Strawberry Topping for Cheesecake is simple strawberry sauce made with fresh strawberries, lemon juice, sugar and vanilla. Recipe is simple and easy. However, this sauce can be used as topping for cakes, cheesecake, ice cream or pancakes, too. To make strawberry sauce in a sauce pan combine half of the strawberries, sugar and lemon juice. Stirring constantly, cook over medium heat until the sauce thickens. Remove from the heat and stir in vanilla and remaining strawberries. Cool to a room temperature, before using. 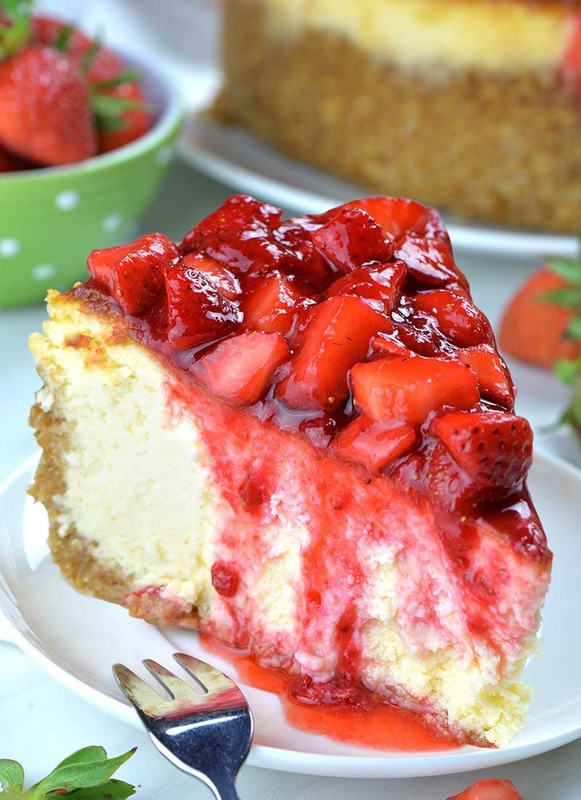 Strawberry Cheesecake is easy recipe for delicious spring and summer dessert. Melt-in your-mouth New York Style Cheesecake with a delicious twist- homemade strawberry topping ! Preheat the oven to 350 F and place the rack in lower third. Place double layer of extra-large aluminum foil under your 9 inch springform pan and cover the bottom and sides of the pan, wrap it tightly around the sides to make sure no water gets in during baking in water bath. To make the crust mix together graham cracker crumbs, sugar, melted butter and salt. Press the mixture into the bottom and sides of springform pan. Bake for 10-12 mins, then set aside to cool. Turn down the oven temperature to 325 F!!! To make the filling beat softened cream cheese until smooth and creamy. Gradually beat in sugar until light and fluffy. Then, beat in salt, vanilla, lemon juice and cornstarch. Beat in eggs one at a time running your mixer on low speed and just slowly combine ingredients until smooth. You don’t want to incorporate a lot of air into the batter. Finally, beat in sour cream. Place springform pan into roasting pan. Pour the batter into springform pan and smooth the top. Pour boiling water in roasting pan halfway up the side of the springform pan make sure no water drip on the batter. Place in the oven and bake at 325 F for 1 hour and 40-50 minutes. Remove the cheesecake from the water bath, dry the bottom of the pan, run a thin knife around the edges to loosen the cake and let it cool to room temperature. Cover the top and place it in the fridge to chill for at least 5 hours or overnight before you add strawberry topping. When the cake is cooled, run a thin knife around the cake and release the ring from springform pan. Transfer the cake onto serving plate. In a sauce pan combine half of the strawberries, sugar and lemon juice. Stirring constantly, cook over medium heat until the sauce thickens (about 8-10 minutes). Remove from the heat and stir in vanilla and remaining strawberries. Cool to a room temperature, then spread over the cake. Can you use a mini cheesecake pan to make individual cakes? Yes, yo could do that! That looks so refreshing and delicious! I make cheesecakes all the time but I can’t wait to try this one. That strawberry topping looks divine and I imagine it would be great on ice cream too.